The United States is increasing airdrops of weapons, ammunition and other equipment to foreign-backed militant forces in the northeastern Syrian city of Raqqah, according to a report. “Our expanded precision airdrop capability is helping ground forces take the offensive to (Daesh) and efforts to retake Raqqah,” Gen. Carlton Everhart, commander of the US Air Force’s Air Mobility Command, was quoted by USA Today as saying. The Air Force carried out a total of 16 airdrop missions in Syria last year; six of those were in December alone, the report said. Officials say the airdrops are meant to boost the capabilities of militants who do not have extensive ground supply lines in a hostile environment. Raqqah is Daesh’s self-proclaimed “capital.” The terrorist group took over the city in March 2013. “In those instances airdrops are absolutely essential,” said Air Force Col. John Dorrian, a military spokesman in Baghdad. The US–led coalition is backing a proxy force of about 45,000 militants, allegedly battling Daesh terrorists in Syria, with airstrikes and dozens of US Special Operations troops. 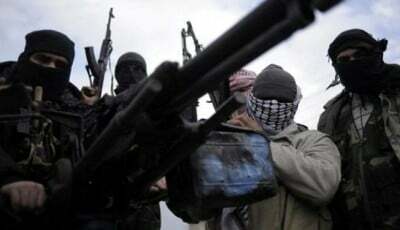 The militants have also been fighting Syrian President Bashar al-Assad, who the US has repeatedly said must step down. The US Air Force uses GPS technology and steerable parachutes to guide bundles of supplies, ranging from small arms ammunition to vehicles, onto landing zones. The Daesh terrorist group has released several videos in the past bragging about capturing weapons and other supplies airdropped by the US military. The State Department said last month that the US could not guarantee that the weapons it sends to militants in Syria would not end up in the hands of Daesh terrorists. The Central Intelligence Agency (CIA) and the Pentagon have also been providing the militants with military training.